Formed of a traditional prescribed iconography that includes geometric shapes and a multitude of ancient spiritual symbols, the sand-painted mandala is used as a tool for re-consecrating the earth and its inhabitants. 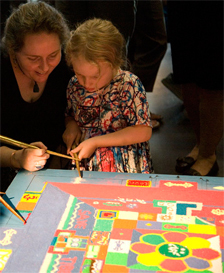 Sand mandala making is a remarkably fine, intricate process, requiring patience, devotion, skill and creativity. For the experienced and proficient mandala maker, millions of grains of sand are painstakingly laid into place on a flat platform over a period of days or weeks. Mandala (kilkhor) he Sand Mandala is regarded within Tibetan Buddhism as sacred and, until 40 years ago, was rarely seen outside the monasteries.